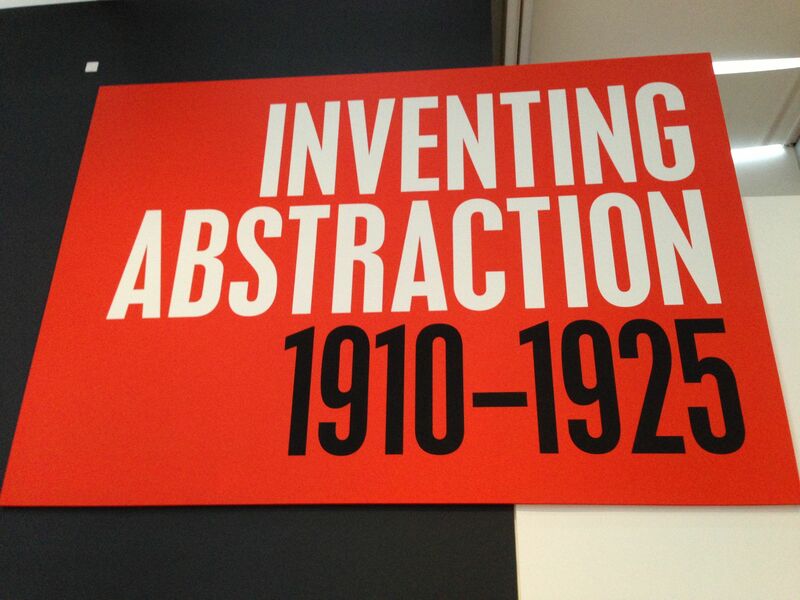 I was in New York City last weekend and stumbled upon a MOMA special exhibit called Inventing Abstraction. I don’t know anything about abstract art but thought I’d venture in. I still don’t know much, but I surprised myself by really enjoying the exhibit and finding a few new friends. A section of the Delaunay painting. Two artists in particular – Sonia Delaunay and Duncan Grant – caught my attention. They both experimented with extended, continuous paintings. In Delaunay’s case, she illustrated a poem by Blaise Cendrars called Prose of the Trans-Siberian and of Little Jehanne of France. The MOMA exhibit displayed her lovely work in a long, glass case, unfolded, so that you could see the way her abstract images wove together with the text of the Cendrars poem. In Grant’s case, he experimented with a long, continuous scroll of paper on which he painted gouache, watercolor, and cut papers. 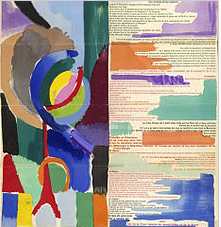 The MOMA exhibit included one such painting of his, Abstract Kinetic Collage Painting with Sound (1914). His idea was to view the painting through a rectangular aperture, 11″ high and 24″ wide. The painting was to be mounted on twin spools, one on each side of the aperture, and then slowly passed across the aperture. Since the viewer’s experience of the painting would be impacted by the rate at which it moved, Duncan determined that the painting should be paced by following a slow movement of one of Bach’s Brandenburg Concertos. Duncan Grant’s Abstract Kinetic Collage Painting with Sound. I couldn’t help but connect this lovely idea to Bill Viola, the video artist. In his essay Will There Be Condominiums in Data Space (one of the required readings in the amazing New Media Faculty Seminars), Viola talks about breaking free from thinking of the video/computer screen as a monitor and, instead, think of it as a window. He encourages us to think of our computers as three-dimensional space, with the viewer wandering through scenes and events evolving in time. The cover of Stephen Greenblatt's new book. Greenblatt is on the speaking circuit because of his new book, Swerve: How the World Became Modern. This book tells the story of a Roman named Lucretius who wrote a poem (“On The Nature of Things“) 2000 years ago, detailing his thoughts on everything from creation to religion to nature to death. The observations in his poem were highly technical and, in many ways, presaged modern science. 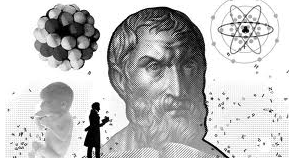 In particular, Lucretius described the universe as a collection of tiny atom-like particles in perpetual motion. Deviations – or “swerves” – in these motions cause collision and alternate forms. As Greenblatt says, “So much that is in Einstein or Freud or Darwin or Marx as there in the poem.” Not only that but Lucretius postulated that the gods may exist, but they are utterly indifferent to humans, there is no soul and no afterlife – when we die, our “atoms” disperse and who we were becomes nothingness (views that are remarkably close to secular humanists). Pretty heady stuff for Roman times – and the times after. Not surprisingly, Lucretius’s poem was banned as it was seen as heretical and disturbing. And so the poem disappeared. Enter Poggio Bracciolini – a pre-Renaissance, Florentine “book hunter” who found freedom in pursuing the wisdom of the ancients, hunting down forgotten texts and manuscripts in the monasteries of Europe. Greenblatt’s book chronicles Poggio’s story and, per his “historicism”, renders him in his time and place. Poggio discovered Lucretius’s poem in a monastery in southern Germany in 1417. Once he delivered the poem, and rescued it from obscurity, the power of its idea did their work. Greenblatt traces the emergence of the poem’s impact through time – the Renaissance, Thomas More, Montaigne, Botticelli, Shakespeare, Thomas Jefferson – to being available for purchase today on Amazon. In his talk at the Concord Festival of Authors, Greenblatt told a number of fascinating stories about his research for the book and about Poggio and Lucretius. One story in particular stood out for me in its relationship to the McLuhan reading we’ve been doing this week. And that is Greenblatt’s evaluation of Lucretius’s work as a Latin poem. Apparently it is an intensely beautiful poem and a powerful execution of Latin at it’s best. Through the years (before the poem was banned), school teachers regularly assigned it to their Latin students as a translation exercise. Scholars saw the poem as a riveting challenge, its Latin structure intensely complex and beautiful. What a wonderful example of the medium being the message. It mattered that Lucretius’s ideas were presented in the form of a poem. 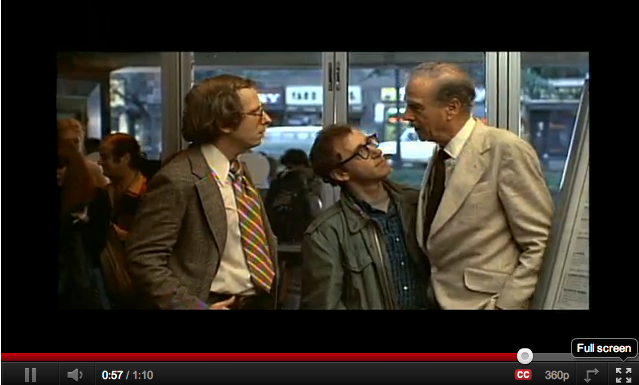 Marshall McLuhan with Woody Allen in the movie, "Annie Hall"
We are now in week #7 of the New Media Faculty Seminar. 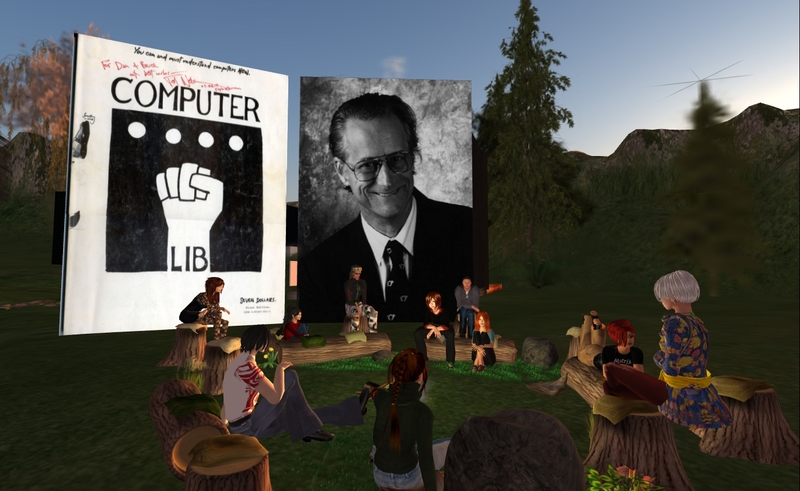 Our NMFS group of educators meet weekly, in Second Life, to discuss readings assigned by Gardner Campbell, the originator of the seminar series. There are 13 of these NMFS groups, scattered around the country, who are all reading the same material and meeting on their own campuses. We are all united through a “mother blog“, where our posts from the individual group blogs are harvested. This week, there were two readings by Marshall McLuhan, an excerpt from Gutenberg Galaxy and The Medium is the Message. I found both (particularly the first one) to be particularly difficult partly due to all the references (many to writers, philosophers, or academics that I do not know) and partly due to the internal inconsistencies in his writing. I was greatly relieved to find that my fellow NMFS-ers felt the same way. Willow Shenlin facilitated our discussion and did a wonderful job, diligently leading us through her favorite McLuhan-isms, as well as the parts that she found particularly confusing. And that’s what is so great about these weekly meetings – not only do they provide a structure to force you to read material you normally would not, but you get a chance to wrestle with the parts of it you don’t understand and benefit from the insights of the group. About mid-way through our 90-minutes, we took a field trip over to Willow’s property in SL to see a few exhibits that she’s put up, to help with the readings and bring them to life. She’d put up a media viewer through which we watched this fondly-remembered scene from Annie Hall, where Woody Allen pulls the real Marshall McLuhan out to counter a blowhard who was standing behind him in line at a movie theater (god, I love that scene). She also showed us this amazing TED talk by Nathalie Miebach which, as Willow put it, I would love to see Marshall McLuhan’s response to! 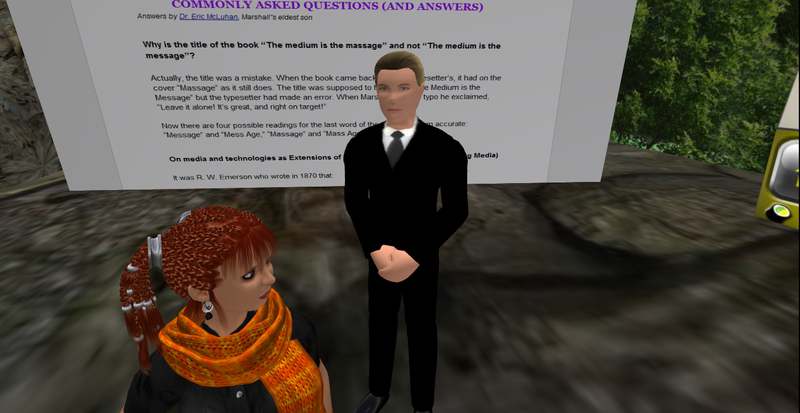 Willow also had a Marshal McLuhan “bot” (automated character) – pictured to the right – that spouted McLuhan quotes from a menu when you clicked on him. It was hilarious – and helped me to relax and let the readings wash over me a bit more. When I reflect on the McLuhan readings, there are a couple of “nuggets” (to borrow Gardner’s term) that are really sticking with me. The first is his idea of sense ratios. How is information coming to us – through our ears? Our eyes? Our fingertips? McLuhan makes the point that changes to these sense ratios have consequences. For example, with the invention of the alphabet and written communication, we shifted from a strong dependence on hearing to a more visually oriented culture. The other McLuhan-ism that I am only now really beginning to understand is his classic “the medium is the message”. I thought I knew what it meant (it certainly has a prominent place in our culture! ), but I now realize that I didn’t. What’s worse, like the blowhard in the Annie Hall movie, I had been misrepresenting it. Oy. In his essay, McLuhan points out that we over-emphasize the importance of content. Let’s say, for instance, that we are looking at an image of a family, sitting around the dinner table, We would argue that it doesn’t matter if the image is a photograph, an oil painting, a screen shot, or a water-color – the important thing would be the content of the image – who is that family and what is happening in that dinner scene? But McLuhan’s point is that the way that content affects us, the way we are able to experience ourselves in relationship to it, will change depending on the medium in which it is expressed. That it matters whether it’s a drawing, a movie, a book, or a television show. He goes on to say that content actually distracts you from what happening technologically. As McLuhan puts it, “Content is the piece of juicy red meat that is carried by the burglar to distract the watchdog of the mind.” So, according to McLuhan, it’s vitally important to be aware of the medium and the tradeoffs and impacts of that medium on us, every step of the way. One of the ways McLuhan tries to make this clear is through the concept of “extension”. That is, that media is not just a tool, it becomes a part of us – an extension of what we can do. I had a breakthrough on this when I listened to the podcast conversation between Gardner Campbell and Alan Levine for the McLuhan session of a past NMFS series, on the heels of our Wednesday session (I wish I’d listened to it before!). Gardner used this perfectly simple and powerful example to explain what McLuhan means by “tools as extensions of ourselves”. Here goes. Aha. The penny dropped for me. And my next immediate thought was how very wrong I’ve been in a key element of my thinking about new media technology (this is the painful part). In my work, I spend a lot of time with teachers and students, talking with them (coaching them) about the use of new media as it’s applied to teaching and learning. What I regularly say, in an attempt to soothe and reassure them, is that all of these wonderful web tools are just that – they are tools. Not unlike a pencil or a chalkboard or a microscope. What you do with the tool is what makes it worthwhile. What you plan, create, devise is what has meaning. Oh dear. Exactly the opposite of what McLuhan is saying. As I sit here and type on this computer (and create this blog entry), the computer (and the blogging platform) have become an extension of me. We are now united to do something that I (or the computer, or the blogging platform) could not do without each other. The computer and the blogging platform are not just tools. They have changed my thinking and the very way I interact with the world. We are united and have moved together to a different understanding. One of the McLuhan quotes that I’ve always loved (and used quite often) is his lament that man is “shuffling toward the 21st century in the shackles of 19th century perceptions”. In his lifetime, he didn’t see the laptop computer, the cell phone, or the tablet – but he did give us a way to think about them, a way to make sure we are in right relationship with our tools and the way we use them. This fall I am a member of an intriguing academic group that meets weekly for discussion. This is the New Media Faculty Seminar (started by Gardner Campbell) and you can read more about it here. The basic idea is a networked collection of small groups, scattered around the country on different university campuses, who meet weekly to discuss a planned series of readings about new media and education. You can think of it as a book group for educators interested in the way that new media tools and applications could/should impact the way we teach and learn. 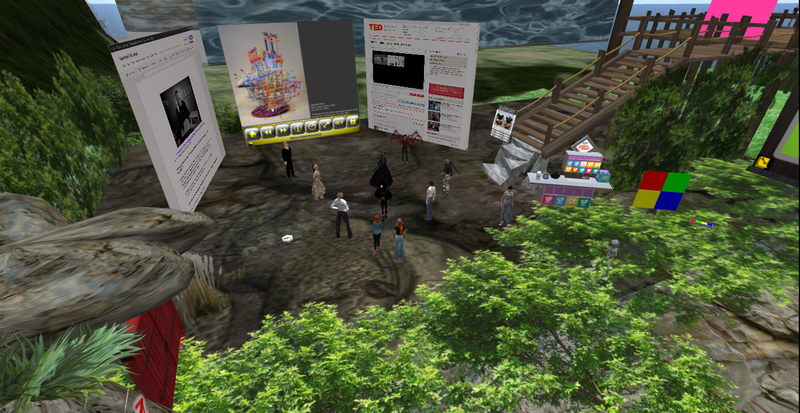 The special twist for our group is that we meet virtually – in Second Life – and our membership comes from over the world. There are about 15 people in our little group – not everyone attends every week (it’s casual) but we typically have ~10 there when we meet on Wednesday afternoons (that’s us in the photo at the top). So far, it’s been a fascinating journey. You can check into the progress of our SL seminar by visiting our group blog. This week’s NMFS reading assignment was Ted Nelson’s Computer Lib/Dream Machine (originally published in 1974). For those unfamiliar with Ted Nelson, he is an American sociologist and information technology pioneer. I read the assignment while squished onto an unbelievably tight (I swear to God airline seating areas are getting smaller) airline seat on a cross-country flight. As I read, I guffawed,nodded (vigorously), snorted, and even raised my fist (right on, Ted!). I’m sure my all together too-close row-mates were wondering about me by the end of the flight but I didn’t care — I loved (LOVED!) it. What did I love about it? I loved the tone of the essay. His happy, joyful way of writing. Casual, funny, irreverent. The little hand-rendered drawings supported the tone and were used well, just when you needed them. I loved his insistence on seeing the big picture – how the small details impact the overall experience, how important it is to keep the long-view in mind. Wasn’t the example of the way the working interface of a car (pedals, steering wheel, gear shift) come together just right? What a perfect illustration of the way our mind works to unify and make sense out of well crafted parts. 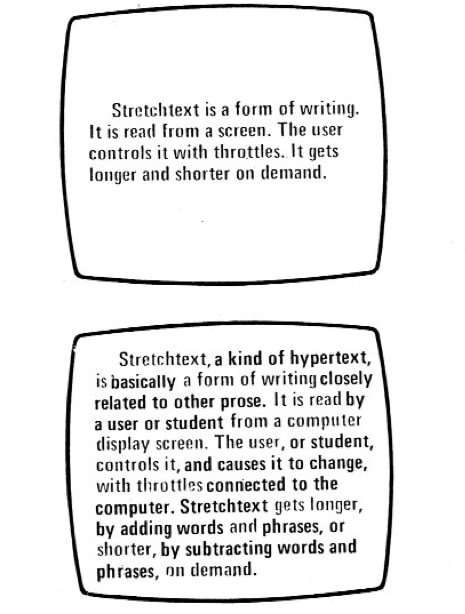 “Stretch text” knocked me out (pictured here). Wow. Just wow. My mind went immediately to the biology book I’m working on and how challenging (but how totally cool) it would be to write it that way. I loved the construct of “fantic space” – like “filmic space” – to consider the environment, the aura, and surrounds in which we are interacting with our information and creating our understanding. Powerful. I loved his assertion that “when you’re dealing with media, you’re in show business, whether you like it or not” — boy, does that ring true for me. The showmanship of ideas and feelings. I loved the line, “we live in media, as fish live in water”. Too right. Nelson’s cautionary notes about the importance of making our digital environments sensible, bringing wholeness to our working environments, so that we will better learn, produce, grow, connect, and synthesize unearthed an ancient memory for me. As I read the essay, trying not to elbow the guy pinioned in the seat next to me, I suddenly remembered the two programming courses I took in college. The first was a FORTRAN course. Now this was the late 1970’s (a few years after Nelson wrote this essay, in fact) and we did our programming on punch cards in batch mode. For those of you who’ve never done this, here’s how it worked. 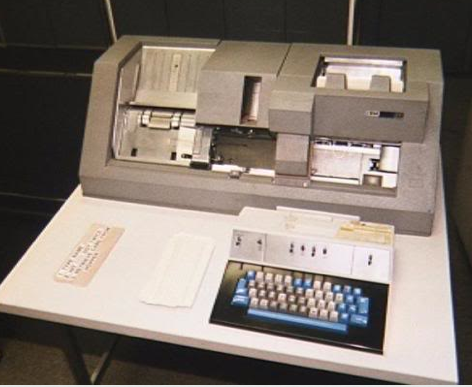 You would plan out your computer program on paper, then go to the lab to sit at a punch machine and keyboard-in your commands. Each line of code was recorded on a single card (with holes to indicate your key strokes). A new card indicated a new line. The cards were gathered by the machine into a stack (quite a large stack, actually, depending on the complexity of your program) and you rubber-banded your stack together, slipped a piece of paper beneath the rubber band with your name on it, and submitted it to the technician (literally a man behind the counter). [Important aside: I was one of the only females in this lab]. Your stack disappeared into a black box of computing wonder and you would return the next day (the next day!) to receive a paper print out of your program, rubber-banded to your stack of cards. Invariably, of course, there was a mistake in your code. Some incorrect key you mistakenly punched or some flaw in your logic that resulted in a jumble of machine code. What I distinctly remember is the feeling that “the machine” was evil. It was deliberately messing with my stack of punch cards. It was terrorizing me by shuffling the deck (in that mysterious overnight assembly process). It was choking the life out of my creativity with its blind, cold, calculating, mechanistic insistence on structure. And I wasn’t alone with those feelings – it was the air of that lab. Everyone joked about it, referred to “the machine” by nasty nicknames, disparaged the dour technicians who took our punch cards, and cursed the process. It was, just as Nelson described, a “cold, sterile, oppressive” place where the computer was guarded from we mere flawed mortals. What if that digital environment had persisted? What if that way of interacting with computing devices was still our norm? If there had been no Doug Englebart, no Ted Nelson, no Steve Jobs? I shudder. The next programming course I took was a BASIC course. By this point, we were working on desktop computers (big ugly ones with flickering green light on a black screen, but they were personal computers and not mainframes). What’s more, the language we were coding in, unlike FORTRAN, somewhat resembled English. It was vaguely understandable. And even more important, we could make changes to our code right there, on the screen, and see instant results. What a difference that made in my “sense” of things. I felt like the computer and I were on the same team. We were pulling together to crack that nut and it was no longer an adversarial relationship. It was almost that “warm, moist, and human” thing that Nelson refers to. The only thing I didn’t like about Nelson’s essay was that, in places, he felt, to me, overly and hubristically critical of teachers.That our present methods are “designed at every level to sabotage the supposed goals of education.” Ouch. My reaction to that was confirmed when I read Jill’s (a fellow seminarian in the Virginia Tech group) wonderful blog post, Ted Nelson Makes Me Cry (me too, Jill, and thanks for saying so). I decided to interpret his description of open-ended, take-it-where-you will learning as hyperbole to make the point. I think we could all agree that schools need to change, that computers and new media can help get us to where we want to be, but that – also – teachers are an important ingredient to the solutions. Maybe the thing I liked most about the Nelson essay was his reminder that “Modest goals give us modest visions”. "The task is the same now as it ever has been..."
This fall I am participating in, what I hope will be, a very interesting experiment. “Awakening the Imagination: A Networked Faculty-Staff Developmental Seminar“. We will meet weekly, from September 12 – December 2, for 90 minutes sessions. The New Media Faculty Seminar is the brainchild of Dr. Gardner Campbell,Virginia Tech University. Faculty members interested in the application of new media to teaching and learning, come together once a week for thoughtful reflection and discussion. The idea is to fire up our imaginations by gathering together to discuss a series of assigned readings. Thoughtful discussions, partnered with blogging and reflection, among a cross-disciplinary group of like-minded people? You bet! There will be a number of these faculty seminars going on, in different parts of the country, all networked together through blogs and hashtags. My particular instance will meet in the virtual world of Second Life (a new, intriguing twist). I just finished the first reading assignment: the introduction to our book of readings (The New Media Reader, MIT Press, 2003) which was contributed by Janet Murray (there is an additional intro, written by Lev Manovich, which I skimmed but didn’t enjoy nearly as much as the Murray intro). Janet Murray (Georgia Tech) is the author of the book, Hamlet on the Holodeck, The Future of Narrative in Cyberspace. 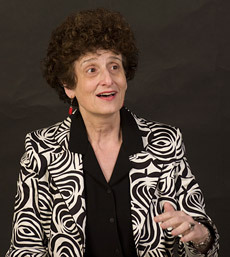 In that book, and in her work, she poses the question, will computers support the development of unique narrative forms, as print media did for novels and film technology did for films? I’ve always appreciated Murray’s clarification of the unique advantages of the computer for interactivity: immersion, agency, and transformation. In her introduction to The New Media Reader, she talks about this as she lays important foundational footing about these advantages that will undoubtedly serve us well in the readings to come. Consider Murray’s point about immersiveness and the spatial properties of the medium. We can put an item here. We can place things of value – and then reliably navigate back to them. Whether it’s a line of text on a shared document, an image on a web page or a teleporter by a tree in a virtual world. It’s that locatable dimensionality, those persistent relationships in extensive space that are so very compelling and useful. Murray goes on to explain that the processing power and participatory quality which allow computers to receive input from us and respond so that we are manipulating, are also critical factors. Our input is processed and responded to in a completely predictable way that makes perfect sense to us. Interactivity. Right. Gardner's "bag of gold" analogy. Murray’s cautionary notes on the issue of technology critics really caught my attention. Important stuff. I so often find myself lamenting the lack of openness, on the part of educators, to participatory media — why can’t they see what’s good here? Why is this taking so darned long? As Gardner Campbell puts it, “It’s a bag of gold!” Murray points out that new media in any age (the cotton gin, the steam engine, the automobile, the printing press) are always distrusted and that those doubts are reasonable. “Fire warms and fire burns”. She reminds us that the doubters are an important part of the process when developing a new medium because they challenge us to think clearly about what we find so compelling here. What are the truly unique affordances and how can they best be put to pedagogical use? A welcome reminder to embrace the doubters and have more patience. And good to remember that getting at those unique affordances, those pedagogical advantages is the topic of this seminar, afterall! Murray traces a clear line of history through the 1950’s to the 1990’s- pointing out key evolutionary steps along the way – Eliza, hypertext, the rhizome as a metaphor for the network, interactive design, video gaming, to the World Wide Web. I found it interesting to note the relief (relief!) I felt in reading this compact historical summary. It occurred to me that we might actually have enough temporal distance on this topic to finally get some perspective! WOW. Just wow. How can we not be inspired by that? !